I'm a JRPG kinda guy. You all know that if you read my stuff. I don't care about the questionable fashion choices my characters make or the pretty colors that beam from the screen while playing my favorite games. I especially don't care that the storylines in many of these games are aimed at a slightly younger audience and get plenty of noses turned up in their wake by soap-boxers who champion how "mature" games have become. I'm a JRPG kinda guy, and it's what I love. For a while there, though, it seemed like I was destined to enjoy the best of both worlds until the end of my days. The other "world" of course being the more PC oriented Western style of RPGs that have taken huge steps over the last decade or so. I was just as easily able to lose myself in the fantasy realm of Skyrim as I was in the countryside town of Inaba, and the two genres seemed on even keel. Something has changed over the last year or so. Passions are fading, and the grim reality of this fling being long term doesn't seem possible. The roller coaster honeymoon I've had with the West is coming to an end, and I find myself settling back down into the stable relationship I have with my JRPG routine. Has the time finally come for my love affair with Western RPGs to lose its spark? Does liking four games make me a fan? Just to give you a little context of where I am coming from, I jumped into Western RPGs about the same time as probably most console gamers my age. BioWare brought Star Wars: Knights of the Old Republic to the Xbox home console, and it proved to be an eye-opener for the Squaresoft disciples of the world. Before the decade was out, BioWare had me in its pocket right up into Mass Effect 2. Bethesda also batted its eyes at me, leaving a massive impression on my brain thanks to both Skyrim and Fallout 3, two more highlights of the genre. I suppose a two-year stint with World of Warcraft that also aided in this transition. Now that I think about it though, was I ever really a fan of Western RPGs? The games I have listed are regarded as some of the greatest games of all time let alone greatest RPGs of all time, but they are also the only games that spark pleasant memories. I never got into Diablo or its army of clones, never was able to truly penetrate the Infinity Engine games without the proper nostalgia, never bothered with Divinity: Original Sin or the isometric ilk that inspired it. Star Wars: Knights of the Old Republic, Fallout 3, Mass Effect 2, The Elder Scrolls V: Skyrim, the sole representatives of the genre that I can comfortably say I "love." Adoring a handful of games that are already believed to be exceptional even beyond the genre's normal fan base does not a true fan make. Especially when those four games span a period of eight years. Was there even ever love in the first place, or just a few fiery epic dates into the exciting unknown that led to misinterpreted feelings? Looking for what your generic Hollywood rom-com would label "a deeper connection." And now my reason for this line of thinking. For the second year in a row, a massive Western RPG has been released to universal praise from the gaming community, and for the second year in a row, I find myself on the outside looking in on this enjoyment. BioWare struck first with last year's hit Dragon Age: Inquisition, and CD Projekt RED continues to make it difficult with The Witcher 3: Wild Hunt. Granted, I am nowhere near deep enough to pass any final judgment on The Witcher 3, but just a few hours in, I already feel myself falling into the same pitfalls I fell into last year with Dragon Age. I don't feel like I'm a part of these fantasy worlds. I feel separate from their horrible situations and morally questionable casts. I watch cutscenes play out, feeling like these are cinematic experiences I'm only allowed to watch from afar rather than a narrative I can actively participate in. I feel a disconnect between story and gameplay that should not be present in a seamless fantasy world. Maybe I was a little spoiled or had false expectations set up by Fallout 3 or Skyrim, but I've always felt that these open world RPGs do best with a minimal plot. The point being that if you truly want to lose yourself at your own pace in a fantasy world, there can be no distractions. What I confused as genre conventions must just be Bethesda's approach, and that's how I really cut my teeth on the genre. It's the same reason I prefer Crackdown and Just Cause 2 over Grand Theft Auto. I don't really see a plot in The Witcher 3 or Dragon Age: Inquisition, I see distractions reigning me in from exploring too far out. I find that only a very thin emotional reaction occurs when comparing a story quest to a side quest, so why bother with the main plot at all? Because that's what you need to do to "beat the game?" I don't see Geralt as my avatar into this world, I see him as wonderful character who I'd rather have my nameless avatar bump into occasionally on the road. Likewise, I don't see The Witcher 3 or Dragon Age's fantasy worlds as gorgeous places to get lost in, I see them as a series of waypoints to methodically kill time in before I get dragged back to the storyline. The objective of enjoying quests in these Western RPGs has devolved into treating markers on a map like potato chip crumbs on a place mat that need to be vacuumed. The irony is that trying to get me more involved in a world with a deeper plot has only pushed me further away by alienating me from what I find most important. Exploration doesn't feel natural, it feels dictated by the plot. Branching away from the path doesn't feel like the norm, it feels like a reward or a gift for tolerating scripted missions. I've felt for a while that we haven't even come close to finding the balance needed between free-roaming exploration and a consistent, cinematic narrative. The two clash with each other more often than they agree, and it seems like the harder we try, like with these last two big attempts, the more obvious this conflict becomes. You can't attempt to be both because you won't succeed at either. Exploration kills the pacing of a good plot, and storyline anchors you in to a linear point to point path you must follow. Besides that, the only way Western developers seem to be able to evolve the genre is making it "bigger." That was the biggest part of The Witcher 3's hype, right? It's bigger than Skyrim? 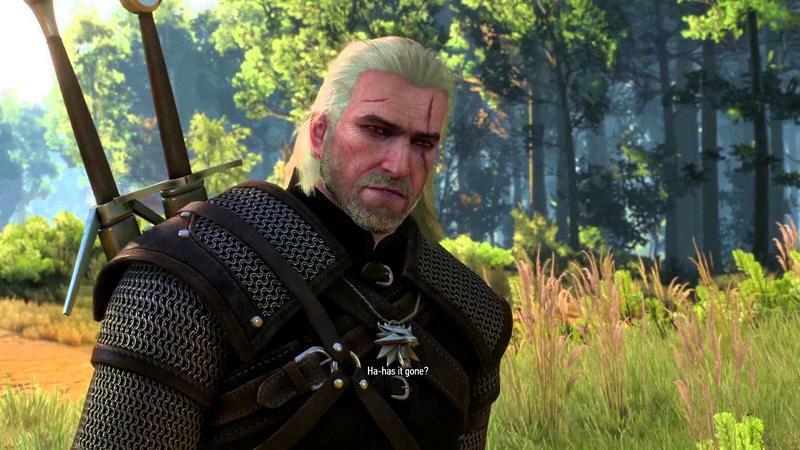 Oh, and Geralt can grow a beard. Sounds like planting an acorn and making a tree to me. But what else has changed since Skyrim came out in 2011? Skill trees remain the same, decision making remains the same, talking to a person and getting a fetch quest remain the same, combat remains as shallow as ever. Do we really need another game that lifts its fighting mechanics straight from Arkham Asylum? All The Witcher 3 does better than Skyrim in its world design is expand the borders a bit, translating to me as "just more running." And even then, its regions are segmented and must be fast traveled between, destroying the illusion of a genuinely seamless fantasy world. And now to address our massive elephant in the room … that game. Oh you know. THAT game. Final Fantasy XV, the next heir in a long line of kingly JRPGs, will be taking similar approaches to its design as The Witcher 3 and Dragon Age: Inquisition. Open-world exploration, traditional cinematic storytelling, waypoints as far as the map can see. Will I be objective and hold it to the same standards, or will it get a free pass because I'm a JRPG kinda guy? It's a fair question to ask, and we'll see. No promises. I've come to a point in my life where my gaming habits clash frequently with what I have available for free time. I'm comfortable in knowing the kind of games I like, and even if for the sake of prioritizing, I might feel more positive about a game that falls within my preferred spectrum. Final Fantasy XV will no doubt have problems, especially after feeling how much of a slag the running can feel like in the demo. Final Fantasy XII wasn't perfect at all either when it attempted the same blend of JRPG storytelling with open-world story, but I was able to forgive it for those shortcomings. But hey … It's Final Fantasy. It's what I do. I'm a JRPG kinda guy. I always will be. I've had my differences with some choices made by the genre in the past, but what we share is a bottomless pit of forgiveness. We've experimented together with new formulas, tried new outlets and platforms, and have come to accept that maybe we are comfortable with a few missteps. The four Western RPGs I claim to love are dwarfed by the dozens of favorites I've enjoyed from Japan over the years. A hypothetical list three pages long at size 12 Helvetica, and I can look back and smile at each and every one of those memories. Looking back on the last few years with Western RPGs, though, I don't quite get it. Did my interest simply peak early with a few excellent games? The thrill of something new? It feels like I dated the perfect woman for a year or so, and once the routine actions of our relationship became exposed through repetition, the curtain was down and we just weren't that into it. The glowing emotion I once felt touring open-world countrysides is now just a purely calculated, mechanical exercise in tedium and habit I don't want, sucked dry because I was trying too hard to force it. I opened the map the first time I got to Velen, and just sighed at the sight of it. If I'm being honest, I don't even want to try to do a quarter of what I see. Too many excuses, and it's even harder to defend The Witcher 3 when I find myself unable to break my immersion and put down the original Final Fantasy to dedicate time to playing it. No, I haven't sunk enough time into The Witcher 3 to pass final judgments yet, but that's not the problem. The problem is I don't feel inspired to sink time into it despite giving several solid attempts. I'm just not into it, maybe not even enough to get to that point. Maybe that's just one way to look at it. Maybe there are other issues like a lack of free time to really go exploring anymore, or on a bigger scale, it could be my issues of becoming disenchanted with big AAA development in general. Maybe I need to stop thinking so much, shut my mouth, and just push through the game. Maybe I could hold onto hope that this date will be the one to save a relationship that hasn't been an active force in my life since 2011. Bottle up and ignore these emotions because that is always the healthiest choice for any crumbling relationship. Who knows? I still believe Fallout 4 could turn this right because Bethesda has never let me down. Maybe BioWare can tap into that old creative spirit for the new Mass Effect. However, judging by how I've reacted to two universally praised games with little more than a "meh," I think the right decision is clear. We need some time apart, Western RPGs. We'll always have Skyrim, but things just aren't working out.